We've been nominated by our buddy Alex J. Cavanaugh for the Movie411 awards and to celebrate we're giving away three $5 Amazon gift cards! 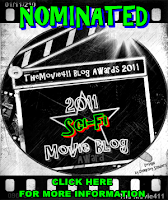 Movie 411 has nominated us for Best Sci-Fi Blog and Best Gossip Blog for 2011. We're very excited! So, we're giving away a bunch of Amazon gift cards to our Google followers. If you don't know what a Google Follower is you can get details here. One of three $5 Amazon gift cards. Become a Google follower of our blog. It's that simple. If you're already a follower then you're already entered in this month's contest! If you do follow us let us know in the comments so we can follow your blog. There are two ways to get extra entries in the contest. One, link back to this contest from your blog and you get another entry in the contest! Two, nominate us for one of the awards. Make sure you let us know in the comments when you've done this so we can give you credit. The winners will be chosen from the list of entries randomly on November 15th and announced on that day in a blog post. The contest runs from October 31st to November 14th 12:00 AM. You must have an Amazon and Google account to participate. A maximum of three entries per person. The Movie 411 awards are a lot of fun and whether we win or lose it's great to be nomiated along with all the other awesome blog. P.S. Make sure you nominate Alex for the awards! He deserves it! Find out more about the contest by clicking the images below. What are you waiting for? Become a follower by using the sidebar or clicking here today! Did you enter the contest? Let us know in the comments! Thanks Reid! It's very exciting!